As if a network possessed, FOX renewed The Exorcist TV show, despite hellishly low broadcast ratings in its freshman outing. 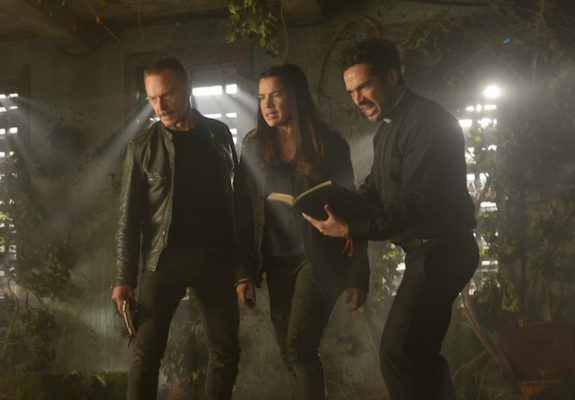 While the Rance family’s story has concluded — meaning Geena Davis, Alan Ruck, Hannah Kasulka, and Brianne Howey are not returning as series regulars — the horror continues for Father Tomas Ortega (Alfonso Herrera) and former priest Marcus Keane (Ben Daniels). Should fans expect further divine intervention? Will The Exorcist be cancelled or renewed for season three? Stay tuned. *Status update below. Based on the 1973 feature film and William Peter Blatty’s 1971 novel, The Exorcist stars Herrera, Daniels, Kurt Egyiawan, Zuleikha Robinson, John Cho, Brianna Hildebrand, and Li Jun Li. Christopher Cousins and Cyrus Arnold join the FOX horror drama this year, on a recurring basis. In the second season, Father Bennett (Egyiawan) sets out to uncover evil at the Vatican, while Keane and Ortega set off to assist troubled foster children, in the Pacific Northwest. 12/16 update: You can see the rest of the latest night’s ratings. For comparisons: The first season of The Exorcist on FOX averaged a 0.68 rating in the 18-49 year old viewer demographic and 1.914 million total viewers (live + same day). What do you think? Do you like The Exorcist TV series? Should it be cancelled or renewed for a third season on FOX? This is one of the best TV shows on air now and i really wish FOX doesn’t cancel it. I really think that there should be more seasons of it. I love the show exorcist!!! I cant wait for season 3. Please dont cut it. I am glad the ratings are going down. It was an ok show to watch, but after they keep showing the gay kissing, then that just destroys any desire to watch. I dont care if gay men kiss, I just dont want to see it, or have my kids seeing it on TV. Actually that is one of the things that makes the show great. The characters being complicated, vulnerable and realistic keep them interesting. I applaud the show for having the courage to feature a gay relationship – the fact there are people who feel the way you do makes it even more important to do so. The best shows help progress and open minds and hearts. There really does need to be many more seasons. This show is AMAZING. The show seems tomget better with each season. PLEASE KEEP IT! I love this show. This season is way better than last season. I really hate that it’s struggling in the ratings. I truly hope this show will get more than two seasons. It would be a shame to terminate such a masterpiece. Complicated and character driven horror shows are hard to come by these days, so I’m hanging on the last thread of hope The Exorcist will return for a third season. As for the ratings…well the problem may be that good part of the viewers are not local, like me. I cannot watch it live, because in Lithuania, where I live, it’s four o’clock in the morning when it airs. Anyway, please keep The Exorcist on air! I loved season 1, but season 2 is even better. I will be very disappointed if this show gets cancelled. There are still 5 more scenarios that were supposed to be solved by my favorite team of intensely attractive exorcists. I hope that more people give it a chance since the story sells itself. I watched the first season, but season 2 just seems like a restart. I feel the demons have the last laugh and all the heroes can do is run. Season 3, if it does happen would yet again be another storyline not related to the events of season 1. It makes you wonder will God win in the end? Cancel the show. I know. I watched all of season one and most of season two on Hulu. Love this show! I love this show and I hope that Fox stays with it. Its destined to be a cult favorite. Its intelligent, well-written, has a stellar cast and is really scary. If they keep it for 1/2 season yearly, perhaps they can make it work. Although, I would love a full season. The creators have a long term plan for the show and I hope they can fulfill that goal. You are absolutely right. I enjoyed reading your comment especially about the creators having a long term plan for the show as I hope that Fox can grant it’s commitment in the long run. This is an awesome season! I really hope Fox renews it for another season. This is the only show I have to watch the same night.